A pretty layered petals flower motif you can make at any time throughout the year, it is a fun project you can use for most items, bags, blankets or clothing etc. if you need that bit of extra decoration It only takes a small amount of yarn so is also good as a stash buster too. See my free Small Flower Applique and Folded Petal Flower patterns. Annie’s Creative Studio, start your 30 day free trial today. Make a magic circle, (RS) ch1, 6sc in circle, pull loose thread of yarn to close, sl st to first sc on beginning of round. You can change color here if you wish. Round 5 – ch1, (1sc, 1hdc, 1dc, 4trc, 1dc, 1hdc, 1sc) in each ch3 space to end, sl st to first sc on beginning of round. Fasten off. 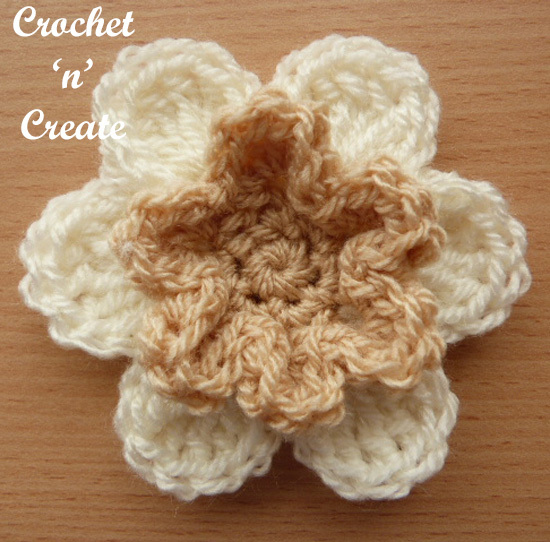 Hope you enjoy this free crochet pattern for a layered petals flower motif, don’t forget to pin! Check back soon for more free crochet patterns. The written instructions and pictures for this layered petals flower motif pattern are copyrighted to crochet ‘n’ create © 2017. 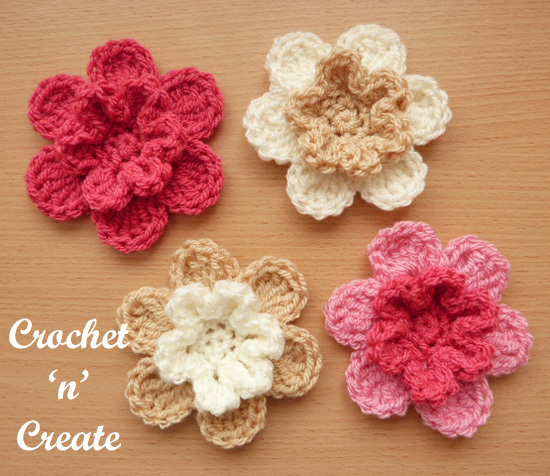 You are welcome to sell the finished products made from the free crochet layered petals flower motif pattern, I just ask that you please use your own pictures and put a link back to crochet ‘n’ create. If you wish to share this crochet layered petals flower motif pattern on your social media or your blog please only use a direct link to the pattern page on crochet ‘n’ create. This entry was posted in Crochet Flowers, free crochet patterns and tagged crochet, crochet applique, crochet flower, free crochet patterns on 17th October 2017 by crochetncreate. Looking forward to trying to make these beautiful flowers.